Let’s consider the daily rider for a moment. Those hardy souls who choose to ride their bikes year ’round represent a small but important group of motorcyclists. 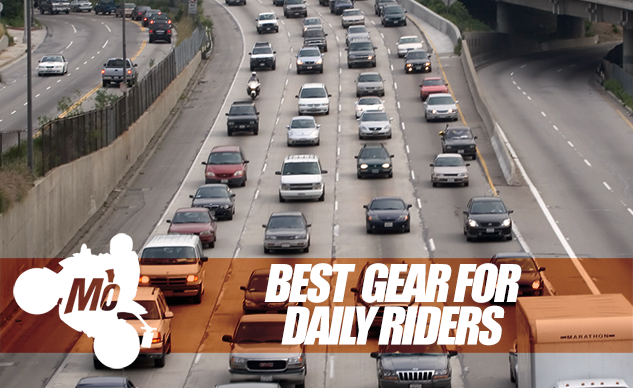 Without them, many commuters wouldn’t know that motorcycles exist. These most frequent of all motorcycle flyers have needs that go beyond what your typical weekend warrior requires (though they, too, could benefit from the items listed below). 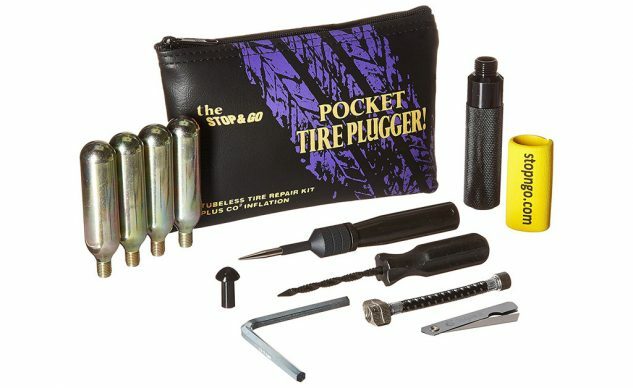 Many of the recommendations are for combatting the elements, but others address common issues like flat tires and carrying things on a motorcycle. Read on, and you may find the special thing you are looking for. What can we say about Aerostich Roadcrafter suits that hasn’t been said already? So, we’ll stick with the usual superlatives. Designed back in the Pleistocene Era as the most functional suit for everyday motorcyclists and anyone who values moto-function over the fickle finger of fashion, the Roadcrafter suit is the great-grandfather of most, if not all, of today’s modern textile riding suits. While always constructed out of Aerostich’s exclusive American-made mil-spec 500d Cordura Gore-Tex fabric, the R-3 expands on the previous generations by including rain-proof zippers, for full waterproofing – even in the vulnerable crotch area. Impact protection comes from Aerostich’s own TF-impact armor with optional back protector mounting. The beauty of the R-3 for daily riders is that it allows the rider to wear street clothes underneath, allowing the transition from biker to civilian to occur in mere seconds. 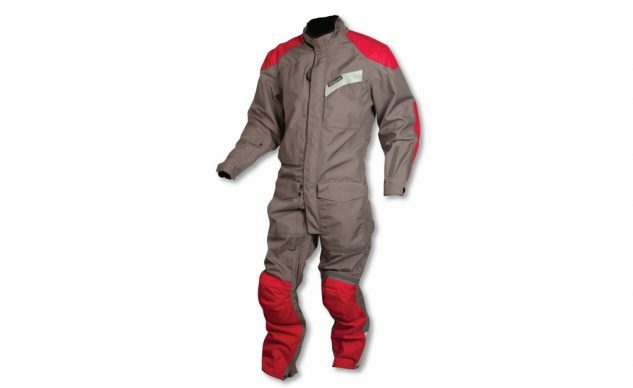 The US-made Aerostich R-3 Suit is available in American sizes 34-54, starting at $1,197 and is only available directly from Aerostich. Want to keep your core warm when the temperature really drops? Providing an external source of heat is the most efficient way. The Kanetsu Airvantage Electric Vest is constructed with a windproof outer layer to fend off cold drafts. The inner layer of the vest consists of the nylon liner that holds a wired heating element. Sandwiched in between those layers is a clever air bladder to provide insulation and a means of pressing the heating elements right up against their torso to more efficiently transfer the heat. A side benefit of the bladder is that it helps to apply an even pressure across the heated wires, eliminating hot spots. (Read our review here.) For those with jackets that don’t seal as well as they should, the Kanetsu Airvantage has optional sleeves ($97) to help block the breeze. 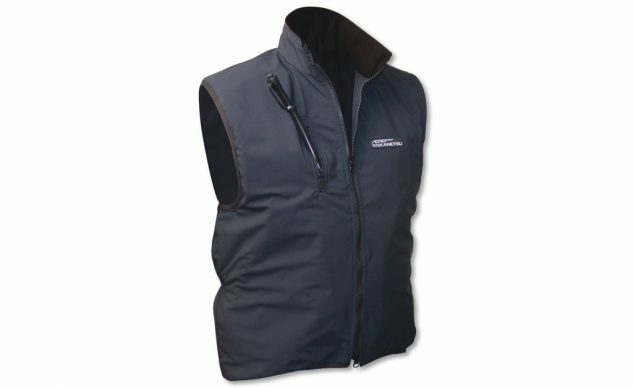 Order your $247 Aerostich Kanetsu Airvantage Electric Vest direct from Aerostich. Those who live in truly bitter climates may want to go for the full-monty Aerostich Kanetsu AIRVANTAGE Electric Liner ($377). 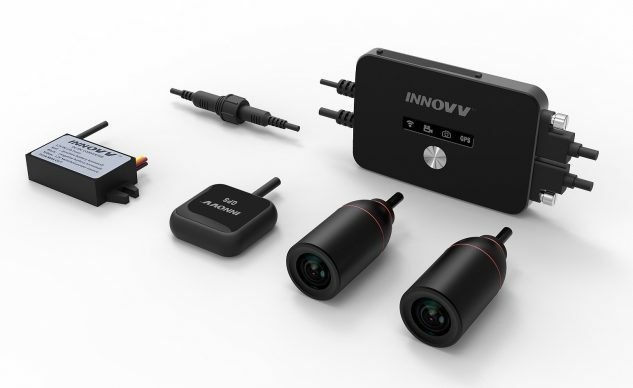 Here at MO, we’ve been fans of Innovv’s motorcycle cameras for a while. Commuters especially need the protection of an always running camera in case someone does something stupid and then tries to lie about it. The newly updated K2 appears to address all of our criticisms of the K1 while maintaining all of its strengths. (You can read our full review of the K1 here.) For a reasonable $338, you receive a DVR unit that powers two cameras (front and rear) and a GPS receiver. The DVR is now waterproof, unlike the previous generation, and riders can access the video files via a smartphone app and wifi connection, making the management of files much easier. The cameras themselves offer a 120° viewing angle and deliver full 1080p HD video at 30 fps. The DVR has a great auto-looping feature that writes over the oldest files once the SD card is full, so that you always have the latest recording. Order yours from Amazon. Daily riders know the importance of keeping the digits warm and limber when navigating commuter traffic. This is where heated grips prove to be worth their weight in gold. The Oxford Heaterz line of grips is built for different classes of motorcycles, from cruiser to touring to adventure to whatever you ride. 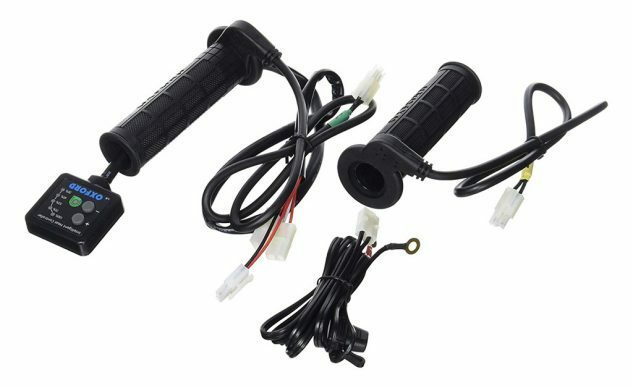 The grips are constructed of rubber with all-silicone wiring to prevent cracking in the cold. The key to the system is, however, the variable settings (five of them!) to tune the heat to your environmental needs. Additionally, the switch will power down if the battery’s voltage drops below 10.5 volts (though we recommend wiring it to switched power to prevent the possibility of killing your battery by failing to turn off the grips). 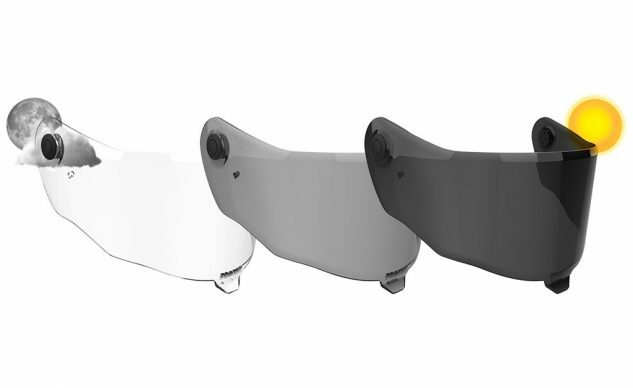 Oxford Heaterz Grips range in price from $70-$100, depending on the application. Find your set on Amazon. Back in the day, you could only strap tank bags to your bike. Then magnetic bags changed everything. However, as aluminum tanks or plastic tank covers over airboxes became more common, straps came back into fashion. What hasn’t changed is how useful tank bags are for carrying stuff on motorcycles. The advent of Adventure styling with the sharply sloped tank back has also created a challenge for tank bag manufacturers. 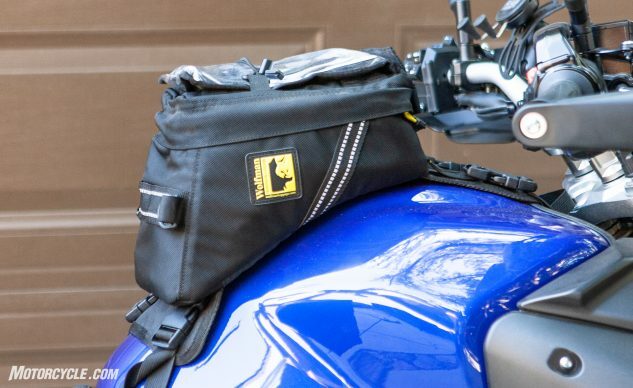 Wolfman has addressed that issue with the Blackhawk Tank Bag, a moderately-sized tank bag that allows you to stand on your adventure bike without hitting your knees on the bag. (Read our review here.) You can buy the Blackhawk Tank Bag directly at a discount from its $170 MSRP from Amazon. Touring riders who want a massive tank bag for larger flat gas tanks should take a look at the Tourmaster Elite Tri-Bag ($199 strap mount, $229 magnetic mount). This versatile 1680-denier ballistic polyester tank bag has a removable lower compartment that can be used as a mini-tank bag. The main compartment holds up to 20L of your gear and features convenient side pockets, a removable map pocket, and a weatherproof GPS compartment. (Read our review here.) Order from Amazon. Backpacks are great for hauling stuff to and fro, and MO editors use them all the time. (Here’s a list of the 10 Best Motorcycle Backpacks, in our humble opinions.) However, the pack you’ll probably see the most on Associate Editor Ryan Adams in photos is the Velomacchi Speedway Backpack 40L (reviewed here). 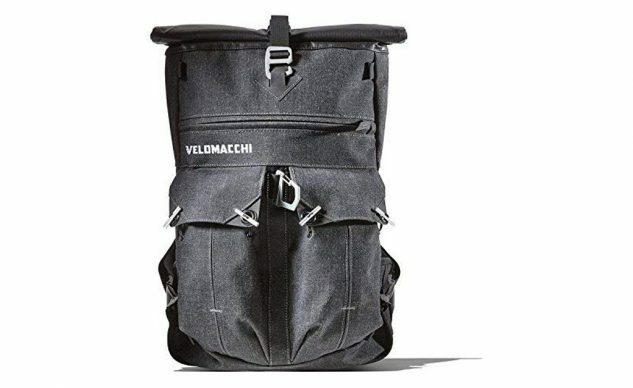 The key to the Velomacchi is its watertight main compartment, which offers flexible storage for a variety of items in its 28L (shown above) and 40L options. The 3-point harness system keeps it comfortably in place while riding. The external pockets hold the little necessities you may need frequent or quick access to. The pack also features tie-down points in case you don’t want to carry it on your back. For longer rides, the pack is hydration bladder ready. All this can be yours for $188 (28L) or $209 (40L) from Amazon.